CLIFTON, N.J. - June 28, 2018 - PRLog -- Joseph Federico, NJMET VP and Director of Operations, announced the company's annual scholarship for Engineering, Science and Technology was awarded to Mr. Stephen Danso Jr., a graduating senior from Passaic County Technical Institute in Wayne, NJ. Mr. Danso excels in the studies of science and technology and will attend Rutgers University this fall in New Brunswick NJ. "It was a sincere honor for me to present the scholarship to Mr. Danso in the presence of his mother and sister" said NJMET Vice President and Director Joseph Federico from their Clifton. NJ laboratory and headquarters. Stephen was presented with a gift check and a plaque by Mr. Federico. 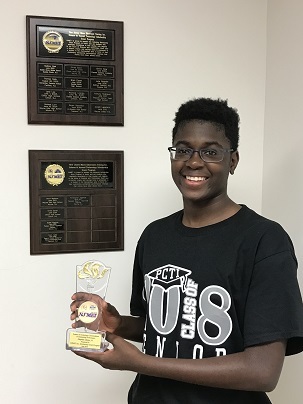 This is the second consecutive year a student from the Passaic County Technical Institute has received the award and overall fourth time in the history of NJMET's scholarship presentations. Last year's recipient from Passaic County Technical Institute was Christopher Valencia. "We at NJMET Inc. are pleased to present this scholarship for the 18th consecutive year and to offer an internship to current college students who will learn the intricacies of electronic component testing in the commercial, industrial, military and aerospace arenas," added Joseph Federico. Announcements of the previous winners of the NJMET scholarship can be found by visiting the NJMET in the News archive on NJMET's website at http://njmetmtl.com/njmet-in-the-news/. For 40 years, NJMET has been a pioneer in the Commercial, Military, Aerospace, Industrial, Automotive and Medical fields providing worldwide quality electronic component procurement, screening and qualification testing of electronic component products.